Across the US, cities and metropolitan areas are facing huge economic and competitive challenges that Washington won't, or can't, solve. The good news is that networks of metropolitan leaders - mayors, business and labor leaders, educators, and philanthropists - are stepping up and powering the nation forward. These state and local leaders are doing the hard work to grow more jobs and make their communities more prosperous, and they're investing in infrastructure, making manufacturing a priority, and equipping workers with the skills they need. In "The Metropolitan Revolution," Bruce Katz and Jennifer Bradley highlight success stories and the people behind them. The lessons in this book can help other cities meet their challenges. Change is happening, and every community in the country can benefit. Change happens where we live, and if leaders won't do it, citizens should demand it. 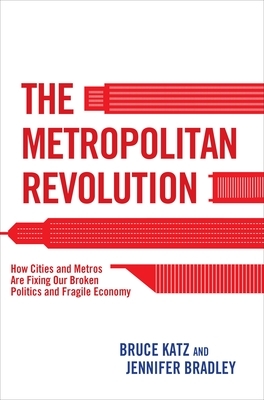 "The Metropolitan Revolution" was the 2013 "Foreword Reviews" Bronze winner for Political Science. Bruce J. Katz is a vice president at the Brookings Institution and founding director of the Brookings Metropolitan Policy Program.Jennifer Bradley is a fellow at the Brookings Metropolitan Policy Program. She has written for The New Republic, the Atlantic Monthly, Democracy, and The American Prospect.